Chrissy Wallace is trying to find Sponsorship to Compete in the ARCA, Camping World Truck Series and/or Nationwide Series. Help Chrissy by Coming On-Board with her. Contact us to find out More Sponsorship Info. Due to lack of finacial sponsorship funds, Chrissy has been unable to compete weekly. However, she is still very much involved in racing, competing in Late Models when possible, assisting Matt Wallace on his racing career and supporting her father Mike Wallace at the race track. CONCORD, N.C. (September 29, 2011) – Fresh off her ASA Late Model championship at Lebanon I-44 Speedway, Chrissy Wallace has been tabbed to run the ARCA season finale at Toledo (Ohio) Speedway next month. The Toledo ARCA 200, presented by Federated Car Care, will be held on Sunday, October 16 to wrap up the 2011 season for the ARCA Series. The 200-lap event on the half-mile paved oval will be shown live on SPEED TV. Wallace, 23 and the daughter of NASCAR driver Mike, is the first female to clinch an ASA championship, which she did earlier this month at I-44 Speedway. She is currently in a tight battle for the ASA Joe Gibbs Driven Oil National championship and the ASA West Series championship awaiting outcomes from other tracks. Cunningham Motorsports has a long association with Andrews, who won the NASCAR Sprint Cup Series championship in 1992 with driver Alan Kulwicki, who will utilize his veteran expertise to guide Wallace’s ARCA effort. This will be her third career ARCA start, with her two previous ones taking place in 2008 at Pocono and Talladega, where she finished ninth. Marketing and sponsorship opportunities are available for this race shown live on the nationally-recognized network of SPEED TV. “This is a great opportunity for me and exactly what I was hoping would happen with my success in the ASA Late Model championship,” Wallace said. 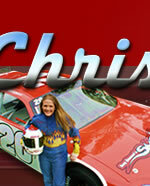 “I know the team at Cunningham Motorsports fields great entries and I’m looking forward to driving for them at Toledo. “Working with Paul is an added bonus because he’s been a friend of the family back when we all lived in St. Louis. He’s a proven success in working with young drivers like me; which will shorten my learning curve at track. In addition to her two previous ARCA starts, Wallace also has two NASCAR Nationwide Series starts and seven in the Camping World Truck Series. CONCORD, N.C. (October 1, 2011) – For the second time in 30 days, Chrissy Wallace has earned another historic credit to her growing racing resume. This time, in addition to her previously announced ASA Track Championship in the Late Model division at Lebanon I-44 Speedway in Missouri, she has now become the first female driver to earn the 2011 West Region ASA Member Track Championship. The 23-year old, daughter of NASCAR driver Mike Wallace, earned the West Region championship once all the other participating ASA tracks and drivers completed their seasons. Her achievement was based off the six victories, 12 top-five and 16 top-10s she earned in 19 starts at I-44 in Missouri. She is also the first female to win a Late Model feature at the track. Beggarly earned the overall ASA National championship racing at Ace (NC) Speedway, while Wallace finished a close third in the national tabulations. Hoping to utilize this achievement to open up other doors in racing, Wallace has already been asked to drive for Cunningham Motorsports in the ARCA season finale at Toledo (OH) Speedway on October 16. That race will be shown live on SPEED TV. This isn’t the first time a Wallace has won a Late Model and regional honors at I-44. Mike was the 1990 champion earning the Mid-America NASCAR Region Championship there winning 21 out of 29 feature races. “It is very special to me because I accomplished the same championships my dad did in 1990,” Chrissy said. “As a team, we never gave up this year at I-44 Speedway and kept digging even harder when we had problems. “I could not have done this without the help of my family, Althoff Trucking, Whirlwind Ranch and my team. Without their help and support throughout this year, none of this would have happened. Congratulations to Chrissy Wallace for taking a stand in the ASA Late Model Series and making a mark by being your 2011 Lebanon I-44 Track Champion!